Snow in Rossendale! Plane de iced at Manchester, then a very scary run/ bus ride through LHR London Heathrowover to T3 from T5 and we're on the plane to Chicago and actually leave on time from a bright and sunny London. Phew. Nice seats (we have the bulkhead... unlimited leg room but sadly a stack of films that probably premièred on TV about a year ago) - Food is ahem - interesting (well its interesting because the wine is free) though the snack before we land is actually good - a nice Mexican Empanada . We arrive a few minutes early into a chilly Chicago and go quickly through immigration which is now automated yay!. 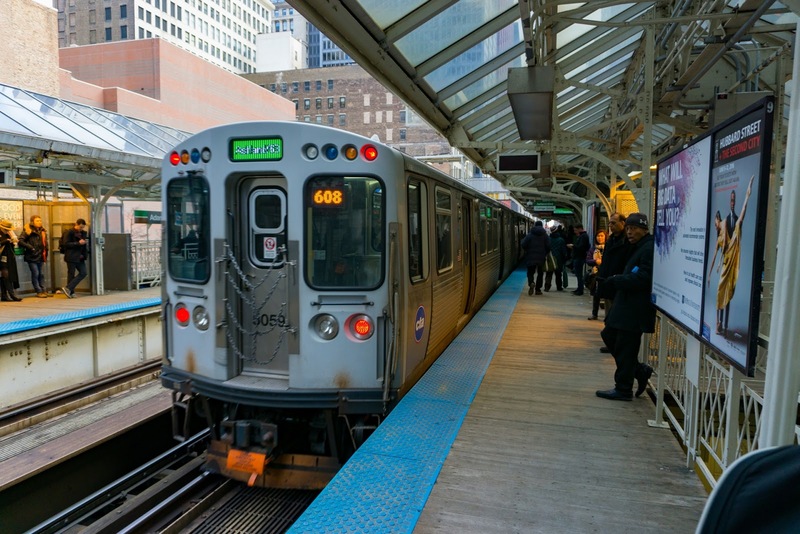 Take the shuttle train QUICKLY (Heathrow take note) from the international terminal to T2 and head downstairs to take the Transit Train to the city on the EL. 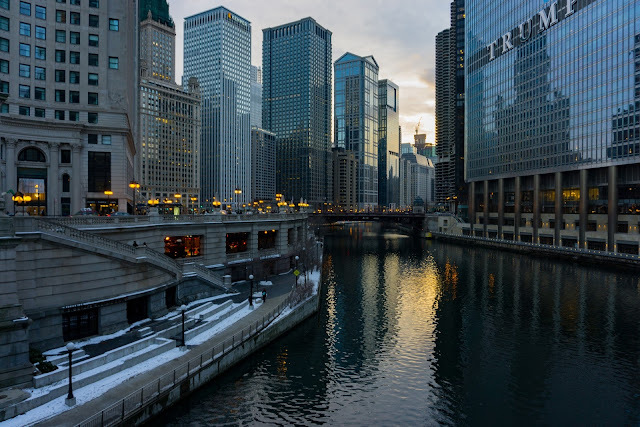 We get off after a half circuit of the Loop at Adams/Wabash and have a few hours before the train departs tonight, so spend it exploring the city. Its one of our favourites - beautiful architecture and space from the shore and the canals to view it from. And of course the iconic elevated transit system winding around the streets. We had visited Chicago previously, stopping in Oak Park for the weekend and loved it but it was certainly warmer then. A couple of days previously Chicago had seen snow that had shut the airports for a while (so it must have been more than than the 1 cm that closes the M66 for a day) but this evening its a clear - very chilly night which really lets the city shine. 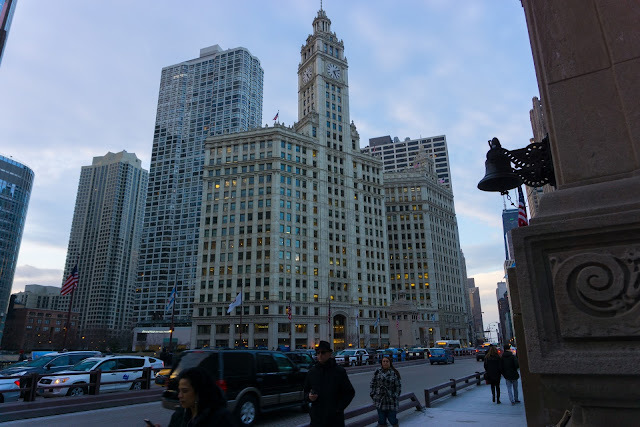 After re visiting the Wrigley Building and walking along the lake shore we grab a nice coffee overlooking the river before heading back to the EL to find Union Station. A couple of stops around the EL takes us to Union Station. I can only assume in America that the railroad was a religion and had buildings built to its worship. 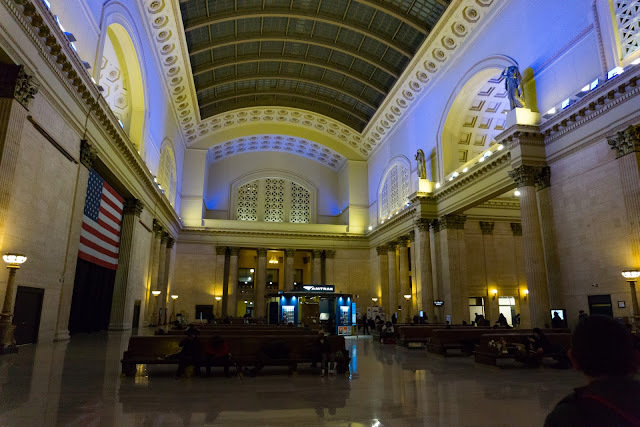 We saw Grand Central Station in New York a few years ago and yes its impressive but Union Station Chicago is just a Cathedral of travel. Trains are not listed on the departure screens by destinations, like the UK. Every train simply has a romantic name - each one recalling an image from a film or song. 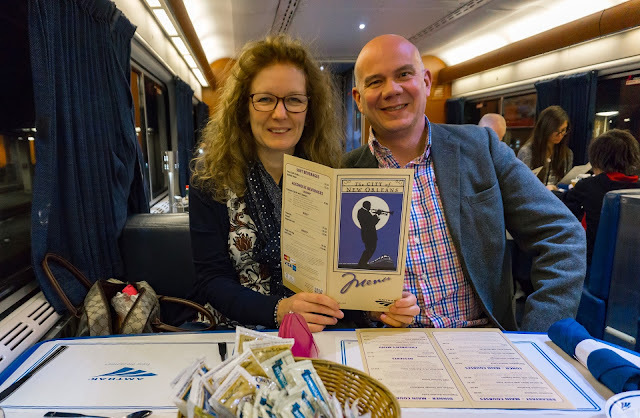 Chicago is the heart of the Mid West Routes so listed for tonight are the "California Zephyr" to San Francisco - the "Empire Builder" to Seattle (both mountain routes we have to do at some point). Also listed is the "Lake Shore Limited" to Boston and the "Texas Eagle" which goes to LA via Dallas. 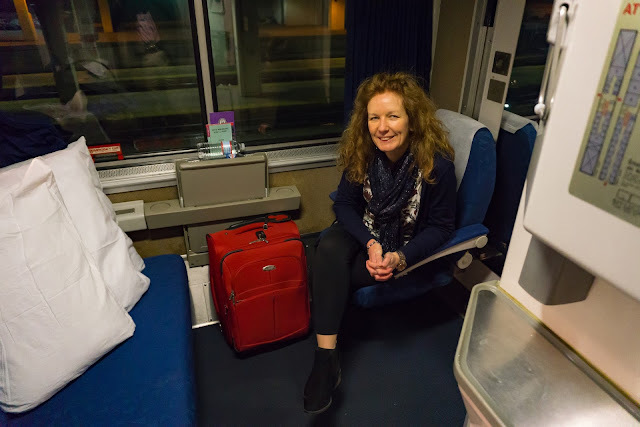 Our train is simply called the "City Of New Orleans" - we will take it half way(ish) to Memphis and leave it for a night before reboarding to carry on our trip to New Orleans. Dinner is great. Its not quite as simple as reading the menu and ordering though as it seems they have loaded the wrong food but the Pot Roast I have is great and enough for two and J's Prawn Jambayala is tasty and nice... and it's all helped by some great wine. Then its time for bed. Ryan has changed the room. 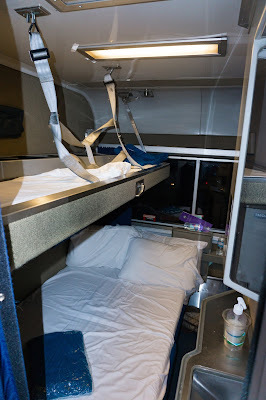 The combination of a horn that seems to be blasting away all night and track that resembles a rollercoaster ride makes for an interesting nights sleep (or lack off) - why on earth do they put the sleeper carriages near to the engine!!! .. But its an enjoyable experience that we would both do again.